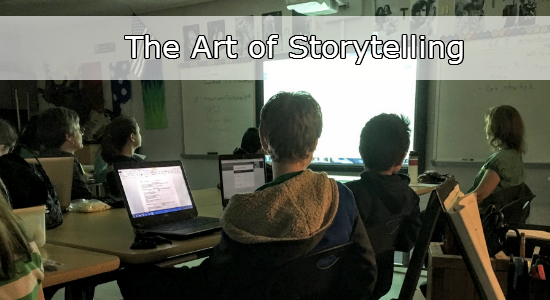 Students were given the opportunity to work with a self selected partner or individually in order to create a high quality digital story consisting of the seven elements of digital storytelling. The students were tasked with producing an emotional story via a multimedia presentation that included photographs, video, animation, sound, music, text, and a narrative voice. This project gave the students the opportunity to select any topic of interest. Once the topic was selected students utilized various research methods, wrote a thought provoking narrative script, collected pictures and added appropriate music. If appropriate pictures did not exist, students designed or manipulated existing pictures using the online photo editing tool Pixlr. Student voice and choice were evident in the fact that they were able to choose from a myriad of creation tools for building their end product. Some of those tools included, but were not limited to, Windows Movie Maker, Adobe Premiere, iMovie and WeVideo. The end products were shared with parents, teachers, and the community who were able to vote on the films to receive special awards. Approaching: Students had to generate their own questions about what they wanted to create a story about and this helped to guide their research. They had to determine appropriate research tools and resources relevant to their topic in order to create the digital story. Once information was gathered, students had to narrow down their material, organize their ideas and research, in order to create a digital story that met the requirements of the rubric. Ideal: Students worked in groups or individually throughout this project. Groups were student selected based on interest of topics selected. The teacher instructed students on how to collaborate purposefully without direct supervision. Even if a student created a film independently, there were multiple opportunities during the unit to give ongoing peer feedback. Students used a variety of digital tools to collaborate and communicate such as google docs, google presentation, email, and WeVideo in the creation of the films. Ideal: Students were given guidance and digital resources for how to create their digital story. From there, groups had to engage in critical thinking and problem solving in order to determine the appropriate application of tools to implement in their digital story. Selection of appropriate images and music to communicate symbolism requires higher level thinking skills. Samples were shown in class and students evaluated other digital stories to determine the effectiveness of each element. Students had to be knowledgeable about their topic as well as their dramatic question in order to communicate their intended message. Ideal: Students had to synthesize many resources (i.e. Audacity, pixlr, digital images, MovieMaker, Adobe Premier, Google documents, etc) as well as self-generated material (the narrative essay) in order to create a unique product beyond the assignment’s parameters. Students were given a great deal of time to explore the different resources to learn how to use them better. This promoted the risk-taking of several students as they learned to use digital tools in new and innovative ways. At the end of the process, students wrote journal entries to reflect upon their creative process. Students also provided feedback and reflection on each other’s films.